The Ultimate off Road machine the 4 Runner is designed to get you anywhere you need to be. 7 Seater Black on Black. 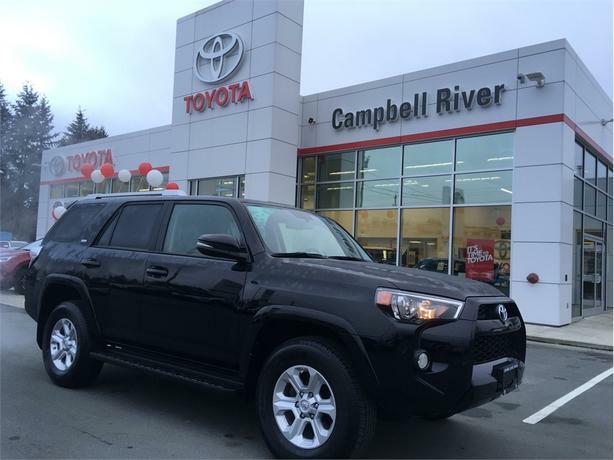 Servicer and Purchased at Campbell River Toyota.Your Way is Our Way!Welcome to Campbell River Toyota! We do things differently here; our business philosophy is based on honesty, and transparency. Our team of professional product advisors match your needs to the perfect vehicle. Our great people keep in contact with you throughout your ownership experience. Above all, they monitor your file with Campbell River Toyota, and alert you if a recall is released or answer questions regarding your Toyota. We have a team dedicated to supporting you on the modern Toyota. From bluetooth, to navigation, to integrated connectivity and personal preferences, all new Toyotas come with the latest technology. Let our team of integrated vehicle technology professionals set up your new Toyota! Your Way is Our Way!Visit our showroom today and see why more people are making their next vehicle a Toyota from CR Toyota! Taxes, and $395 Documentation fee, are not included. *We take every reasonable step to insure all information related to each vehicle is accurate and up-to-date. Always review vehicle details with your product advisor.